Attempt no form of self-defense. Attempt to defend yourself against the perpetrator at all. Attempt to defend yourself against the perpetrator specifically using a firearm. Which of those options do you think will have the lowest probability of you being injured in the situation? Does your answer change if we are talking about a robbery, as opposed to an assault? Does your answer change again if we are talking about the lowest probability of your property being stolen from you during a robbery? In other words, you are almost half as likely to get hurt during a robbery if you employ a firearm to fight back, you are over three quarters less likely to lose personal property during a robbery if you use a firearm to defend yourself, and you are about half as likely to sustain injury during an assault if you stop the attacker with a firearm. It is almost like the “gun control” extremist’s notion of “give them what they want and they will go away” is… nonsense. The 250lbs. thug is not going to try to assault a 400lbs. linebacker. Nope, he is going to go for the 90lbs.-soaking-wet cheerleader, and when she tries to fight back with her bare hands, guess what? It is highly likely that she is going to lose – and get injured in the process – simply due to mass and strength. Provide her a firearm and a modicum of training, however? Well, there is a reason why people say, “God made man, Sam Colt made them equal”, or why other people describe firearms as civilization itself. 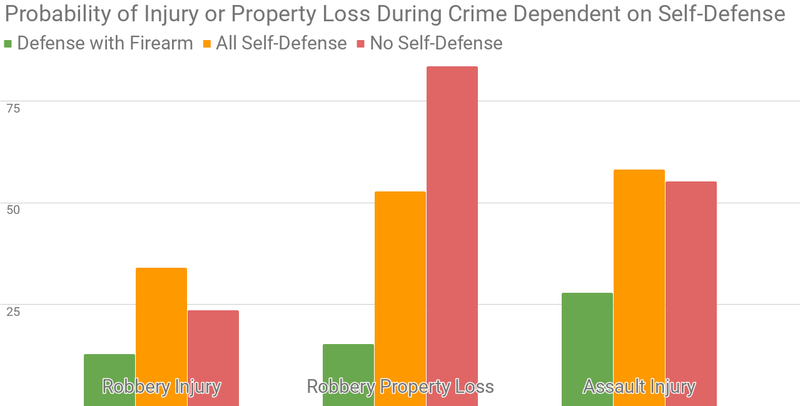 Given this data, one really has to wonder why “gun control” extremists want to massively increase your chances of being injured or losing property during an assault or robbery. Perhaps your safety is not actually their priority? 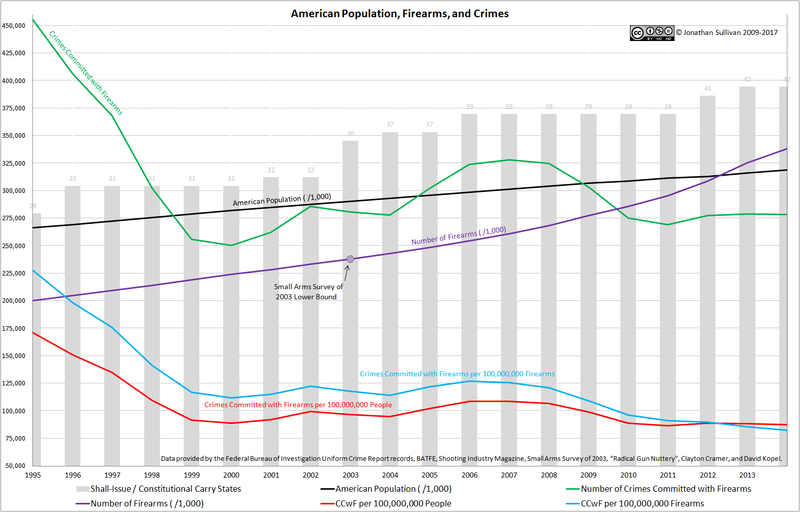 The first version of this post (on this site, at least) provides the full explanation of how and why this series exists, but the same two disclaimers from the first part of this year’s edition apply to this one as well: “more guns = more ‘gun violence'” is not my hypothesis, and I am not setting out to prove causation. As with last year’s update, I am using the usual sources: the FBI’s Uniform Crime Report for 2015, the Centers for Disease Control, the Small Arms Survey of 2003, the BATFE’s Firearms Commerce in the United States, and Radical Gun Nuttery. So, have the “gun control” extremists’ pipe dream of “more guns = more ‘gun violence'” finally come true? You probably already know the answer. The rate of average firearm ownership in America and the rate of crimes committed with firearms correlates with a coefficient of -0.734, indicating a strong, negative correlation between the two. 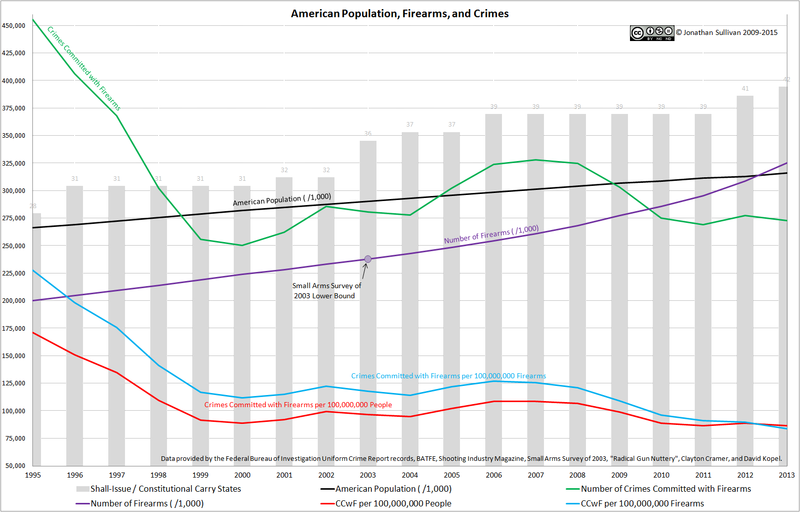 The raw number of firearms in America and the raw number of crimes committed with firearms correlates with a coefficient of -0.40019, indicating a negative correlation between the two. In other words, the hypothesis of “more guns = more ‘gun violence’ remains false. Still. So, with another year of data under our belt, does my answer to the hypothesis of “more guns = more ‘gun violence’” change? The short answer is that the rate of firearm ownership correlates with the rate of crimes committed with a firearm with a coefficient of -0.57582, showing a negative correlation between the two. Likewise, the raw number of firearms in private hands correlates to the raw number of crimes committed with a firearm with a coefficient of -0.44568, also indicating a negative correlation between these two data sets. In a shock to no one, the hypothesis of “more guns = more ‘gun violence'” still cannot be true. As always, please feel free to check my work (*.xlsx file). Now that we have dispensed with the myth that “more guns = more gun deaths”, what about the second-most-favorite talking point of the “gun control” movement: “more guns = more ‘gun violence’“? Well, the first problem is what, exactly, is “gun violence”? For simplicity’s sake, and for the sake of actually finding relevant data, I am going to define “gun violence” as “any crime committed with the assistance of a firearm”, or “CCwF” for short. Specifically, after consulting the Federal Bureau of Investigation‘s Uniform Crime Reports for 2013, we are going to consider murders, robberies, and assaults where the perpetrators employed a firearm. As with the previous post, the Centers for Disease Control will be providing the population of the United States (though we will not be using WISQARS, since we are not interested exclusively in fatalities or injuries), the Small Arms Survey of 2003 will provide the starting point of our firearm count estimation, with the Bureau of Alcohol, Tobacco, Firearms, and Explosives and Shooting Industry News providing the production numbers, and Radical Gun Nuttery did the counting for the number of “shall-issue” / “Constitutional carry” states out there. So, given all of those wonderful numbers, do more guns really mean more “gun violence”? For the numerically inclined, the rate of firearm ownership correlates with the rate of crimes committed with firearms with a coefficient of -0.58535, indicating a negative correlation between the two data sets. 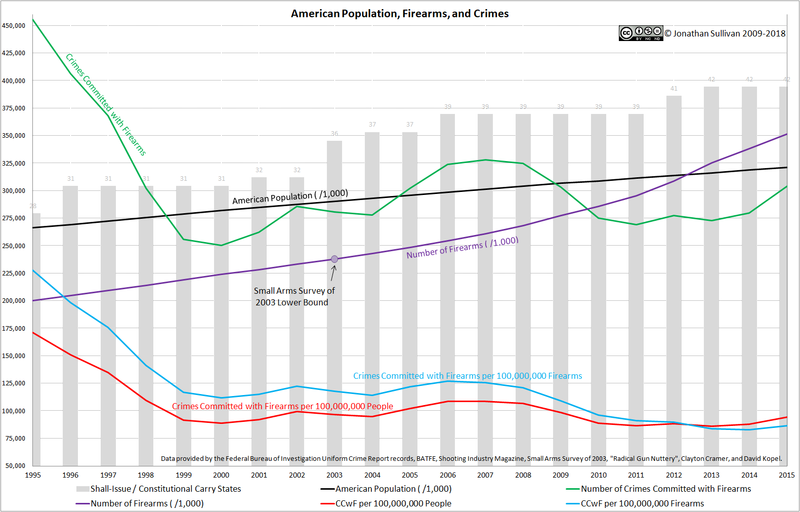 Even when we consider raw numbers, the number of firearms in America versus the number of crimes committed with firearms correlates with a coefficient of -0.46199, still indicating a negative correlation. In other words, the hypothesis of “more guns = more ‘gun violence'” cannot be true. Again, feel free to check my work (*.xlsx file); folks have pointed out mistakes I have made in the past, and I am always seeking greater accuracy. Also, it is worth noting that somewhere in the 2012 to 2013 range, assuming the Small Arms Survey of 2003 is even close to accurate, America reached parity between its population and the number of firearms in its borders; there are enough firearms for every single American to own one. I dare say our Founding Fathers would approve. graphical representation Blog at WordPress.com.